The AKAI MPC has defined the sound of Hip Hop music. 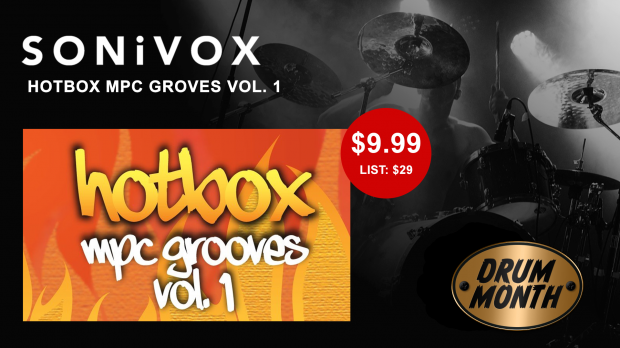 The Hotbox MPC Grooves Vol 1 MPC features over 175 world-class Hip-Hop drum loops for your Hip Hop tracks. During Drum Month this amazing library on promo at over 65% off. Hip-Hop artists the world over continue to trust one element over all others for producing their magic: Akai MPC. Given this technology of choice, we have embodied the very soul and rhythm that has inspired so often in this powerful and versatile collection of Hip-Hop drums. Hotbox Vol. 1 features over 175 world-class Hip-Hop drum loops and 100+ one-shots featuring Hats, Kicks, Snare, Percussion, FX and much more for superior track construction. This entry was posted in DontCrack, Promotions, Sounds and tagged Akai MPC, FX, Hats, Hip-Hop, Hip-Hop drum loops, Hip-Hop drums, Hotbox MPC Grooves Vol 1, Kicks, Percussion, Snare, SONiVOX. Bookmark the permalink.